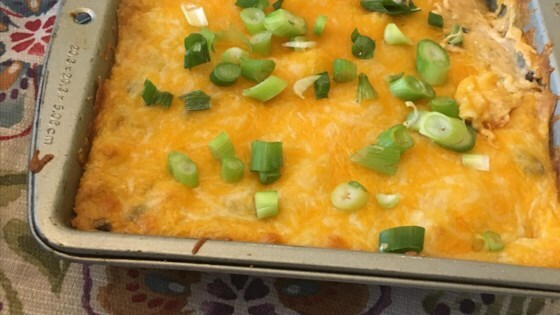 "This bean dip is sooooo good. It is easy to make and is always a hit. I make it for my Super Bowl party each year and it is always gone before half time!! Two cheeses and refried beans are baked with mild spices to create a creamy dip. Serve with tortilla chips." In a medium bowl, blend the cream cheese and sour cream. Mix in the refried beans, taco seasoning, hot pepper sauce, parsley, green onions, 1/2 the Cheddar cheese and 1/2 the Monterey Jack cheese. Transfer the mixture to an 8x12 inch baking dish. Top with remaining Cheddar and Monterey Jack cheeses. Bake in the preheated oven 20 to 30 minutes, until cheese is slightly browned. I mixed everything in the food processor -- beans, cream cheese, onions, etc. The dip had a real smooth texture, and it disappeared at the function that I took it to, so it must have been a hit. Big hit at this year's Superbowl party! What a hit! It makes a ton - so I usually freeze half before cooking it - then when I want it again it is all set to pop in the oven. I also added jalopenos for extra heat.